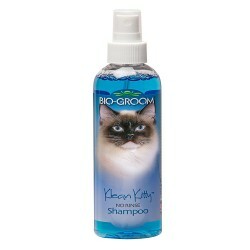 Product Details-Size - 236 ML, Brand -Bio - groom, Suitable - All breeds of cat from 2 months onwards. Product Information-This product allows you to shampoo your pet without wetting or rinsing when bathing is not practical. It contains conditioners that leave the skin and coat looking and feeling its best and Its remove stains and it contains no harsh chemicals, leaves no irritating residue, and PH balanced and mild. Buy the best pet grooming products in Mumbai from the leading online pet product store. Order pet accessories online from the best pet product store.